https://greenronin.com/freeport/wp-content/uploads/sites/6/2017/10/FREEBOOTER-thumb-200x232-133.png 232 199 Evan Sass https://greenronin.com/freeport/wp-content/uploads/sites/6/2015/01/FP_WP_Logo.png Evan Sass2017-10-06 20:53:542017-10-06 20:54:04Green Ronin Freebooters - Run games for us! 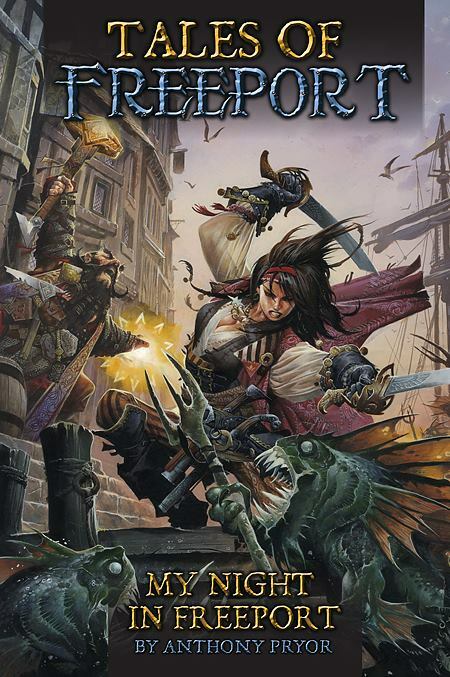 While Freeport City of Adventure was written specifically to work with the Pathfinder Roleplaying Game, Freeport has a history with class- & level-based RPGs with a core d20 mechanic that predates Pathfinder. 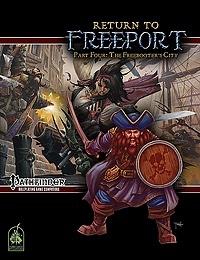 Freeport has always been a location that’s easily adapted to new game systems and settings, with much of the core information it provides (such as maps, factions, politics, and adventure seeds) are useful to a GM building a campaign or adventure regardless of the game system used. 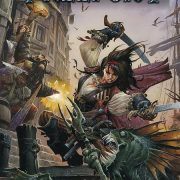 Thus with the recent release of the Starfinder Core Rulebook, a new game and new setting built off the Pathfinder Roleplaying Game and advancing its campaign world thousands of years in the future, it seems a perfect time to discuss how Freeport City of Adventure (and the Freeport Bestiary) can be adapted to spacefaring campaigns! 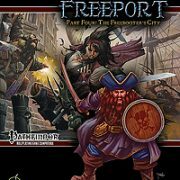 While it may seem that a sailing-ship port doesn’t have a lot of relevance to a science-fantasy game, it’s actually not at all difficult to adapt Freeport to a Starfinder Roleplaying Game setting. The simplest way is to leave it on its island, and make it a major starport in a system that is along a significant trade route but far from any major government within your campaign. This allows the layout to be largely unchanged (starships might even dock in the water, as a cheap alternative to expensive high-tech landing pads), and keeps all its internal politics intact. All mentions of ships are simple adapted to starships, and local groups and NPCs are updated to their high-tech equivalents. The city’s factions, history, and even many of its adventures can be easily translated to science-fantasy equivalents. Though it takes more work, Freeport can also be adapted to be an independent spaceport free of any planetary body. It can be placed on an asteroid with an environmental field keeping air in (again allowing the existing map to be used), or even turned into a massive (potentially mobile) space station. For this last option you’d likely need to create a new map (or accept a really oddly-shaped space station), but the scores of shops, temples, homes, and buildings in Freeport can be adapted largely unchanged by simply assuming their technological base (and goods, and NPCs) are updated to appropriate levels. 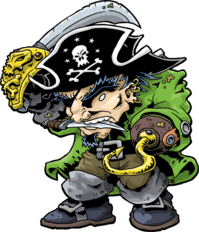 Obviously rather than flintlock-carrying, peg-leg bearing sea pirates, this updated Freeport is an open base of operations for space pirates. Some may cling to ancient fashions and traditions (eyepatches strapped on even over cybernetic eye enhancements), but in generally their technology and appearance changes to match the campaign setting. 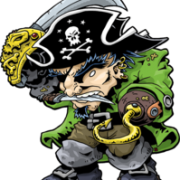 However, ship names, rivalries, debts, rumors, and rough parts of town remain conceptually the same whether your pirates and their home sport flintlocks or plasma pistols. 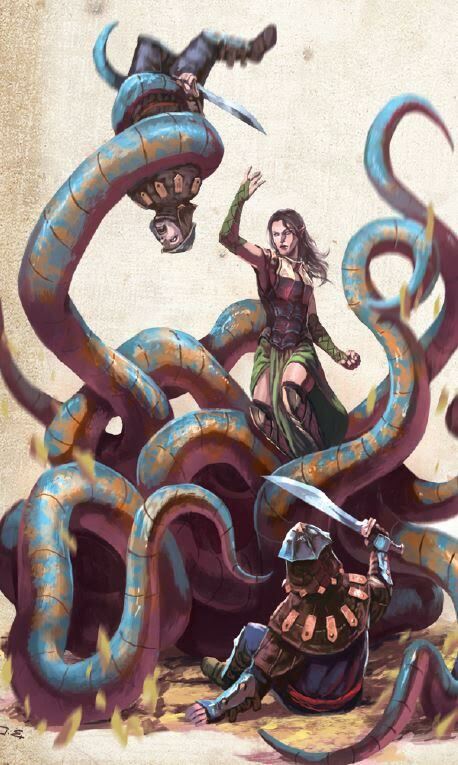 Especially given how vast an entire galaxy of adventure is, having a fleshed-out set of goals, organizations, and names is extremely useful, even if you need to update the gear and stat blocks of anyone the PCs decide to fight with. Finally, although it’s not as useful in most science-fantasy campaigns, Freeport can be dropped into a science-fantasy game largely unchanged. In this case it remains a low-tech sailing ship port, on a world with much less advanced science than a typical Starfinder Roleplaying Game setting. This makes the most sense if you want your high-tech PCs to have at least one low-tech world they interact with. Freeport might be on a planet where advanced technology doesn’t function for some reason, or under a powerful protectorate that ensures its culture isn’t irreparably altered by spacefaring visitors. Or it could be a world that is perfectly well aware of lasers and starships, and happy to trade local materials for such advanced tech, but simply lacks the industrial base to recreate circuit boards and transistors even when such things fall into local hands. 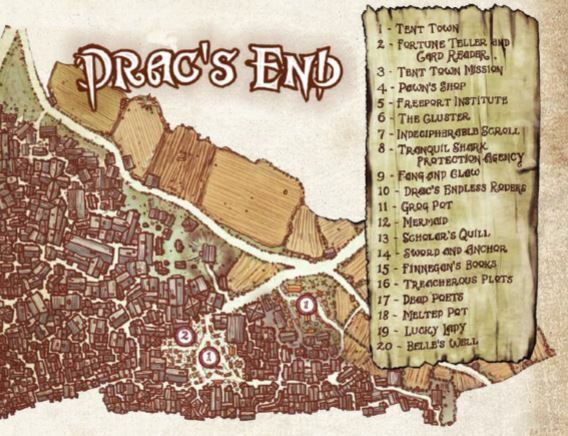 While much of the material in Freeport City of Adventure can be updated to a far future setting with nothing more than the flip of a conceptual switch, the numerous named and generic NPCs are more useful if you can use them in your campaign when needed. In general, you can convert an NPC’s stat block using the same process as converting a monster stat block using the guidelines in Chapter 13 of the Starfinder Core Rulebook. This will tell you what skills to change, how to create a target’s EAC and KAC, how to generate Stamina Points, and so on. Most of the conversions are simple enough they take at most a minute or two, and you can actually ignore most of them and just use any appropriate-sounding skill for science-fantasy skill checks (it doesn’t really matter if you use Diplomacy as a Computers check, if you have an NPC you want to be good at computers, and you can simple use half an NPC’s hp as Stamina and half as Hit Points and give them all 3 resolve Points). The end result may not be exactly what a Starfinder Roleplaying Game npc of the same level would have, but it’s close enough. Equipment is a little trickier—but only a little. You can either just change what an NPC’s equipment looks like (and change reload needs from once per attack to one per 10 attacks) and allow the NPC to attack multiple times based on iterative attacks and two-weapon fighting and similar options, or you can upgrade the NPC to level-appropriate weapons from the Starfinder Core Rulebook, and add the NPC’S CR to the damage. 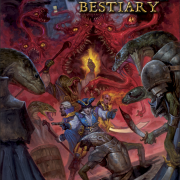 The Freeport Bestiary has a huge number of monsters that players won’t be expecting, making it a great resource for populating strange planets, new worlds, and the drifting hulks of abandoned starships. 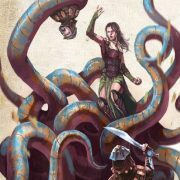 Altering a monster’s stat block is largely the same process as adapting an NPC stat block. However, a monster may need some additional changes made to make sense in a Star-Freeport setting. For example, aquatic creatures you would normally encounter at sea should either be updated to exist in a wide range of environments (including flying in gas giant planets, and even travelling through the void of space), or be set up as creatures that might sneak onto a ship, be transported by PCs (perhaps as part of a space menagerie) so they can escape and cause havoc, or be adjusted to be planar creatures able to travel through realities (and possible be encountered during hyperspace travel). The important part is to make sure PCs don’t have to go to a planetary body of water to encounter them. 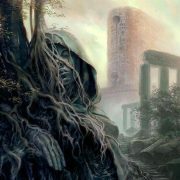 Similarly monsters tied to specific terrain types, be that jungles or underground caverns, should be liberally re-envisioned to dwell in fungal forests, asteroid interiors, or the crypt-worlds of necromancer robots, as needed to fit the campaign. Constructs may be given the technological subtype to represent various robots, or left as magical creatures powered purely by eldritch forces. 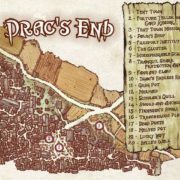 Other monsters can simply be moved to locations the plot sends PCs to. 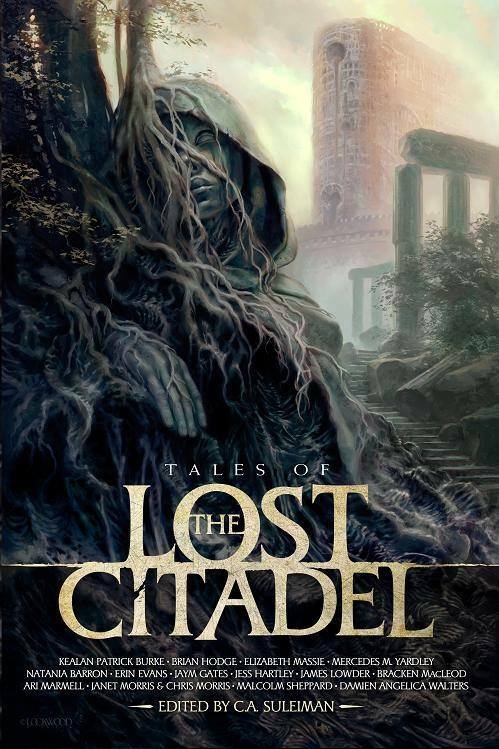 It doesn’t much matter if an ancient ruined temple is a remnant of a long-lost serpent-folk empire on one world, or part of a reptilian civilization that spanned a thousand star systems, if it’s an adventure site it needs demonic traps, undead lurkers, constructed guardians, and inhuman intelligences with their own reasons for breaking in. The very fact most players won’t think of Freeport material as a natural fit for a science-fantasy game means they won’t see it coming when Mr. Wednesday has a task for them involving tracking down the privateer starship Morgenstern, or offers to vacate their gambling debts if they’ll deal with a bloathsome that’s settled on an asteroid with valuable mining concerns on it. We have several products pre-ordering currently, but time is running out! 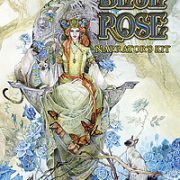 Through the end of May, 2017, when you pre-order the print version of Blue Rose: The AGE RPG of Romantic Fantasy, Blue Rose Narrator’s Kit, and the Freeport Bestiary (which is for the Pathfinder RPG) through our Green Ronin Online Store, we’ll offer you the PDF version of the relevant title(s) for just $5 during checkout. Just click the Add to Cart button on the popup to get the deal. 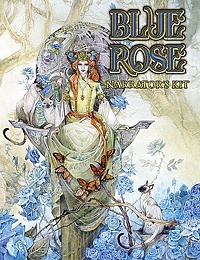 The Blue Rose Dice Set is also pre-ordering right now through the end of the month, but it doesn’t have a digital counterpart. Other recent releases you may have missed are Love 2 Hate Politics and Love 2 Hate Comics, expansions for Love 2 Hate: The Party Game for Inappropriate People. 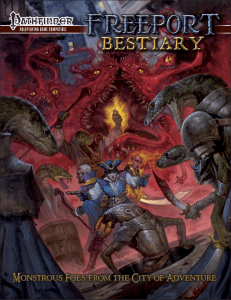 The Freeport Bestiary is almost here! To celebrate, we have uploaded a PDF preview from the book showing off the deadwood tree. These hateful, unliving monstrosities were created in the fall of Valossa, and seek to destroy all life that they encounter. There’s just one more week to pre-order the Freeport Bestiary for the Pathfinder RPG, and get the PDF version for just $5. The pre-order ends at midnight next Friday, May 26.